Well I started off the month strong and intended to blog every single day for National Blog Posting Month, but I just wasn’t feeling it yesterday. I’m a little disappointed in myself, but I’ve written more this month than I had in many months so I’m calling November a success. Do you ever see a picture on a blog, like for Wordless Wednesday, and wonder about the back story for it? I often do, so I thought it would be fun to share the story about one of my favorite photos. I’ve shared this photo on my blog and on social media, but I don’t think I’ve ever shared how it happened. Since it’s still kind of sort of Veterans Day I figured it would be a fitting one to explain. A call to arms: Cathy Herard’s light up as she holds husband Paul Herard in her arms yesterday at 32nd Street Naval Station. I remember the day so well because I was ridiculously nervous as I got ready to head to the dock for the arrival of Paul’s ship. He and his shipmates had been underway (out to sea) for four months, which felt like an eternity since I was alone in San Diego with no family and only a handful of friends. I spent some time with a couple of my girlfriends as I counted down the minutes until the ship’s arrival and one of them couldn’t understand why I’d be nervous to see Paul instead of just plain excited. I couldn’t really explain it at the time and I still can’t, really, except to say my stomach was filled with butterflies and my heart was bursting with love. Also, there’s nothing quite as special as seeing a ship literally lined with sailors in uniform arrive in the harbor, especially when one of those sailors is your husband in his dress blue uniform. So back to the photo. It was actually taken on the ship and I had no idea at the time, which I’m really glad about because the photographer (Jerry Rife) captured the moment perfectly. I don’t think a posed photo could have come close the beauty of this one, so thank you Mr. Rife. Thank you so much. So, we had our reunion and the next morning we woke up to a copy of the newspaper outside our apartment door. A good friend of mine, who happened to also live in our building, had left it there with instructions on what page to look at. I couldn’t believe it when we flipped to the section and saw our picture with that caption. 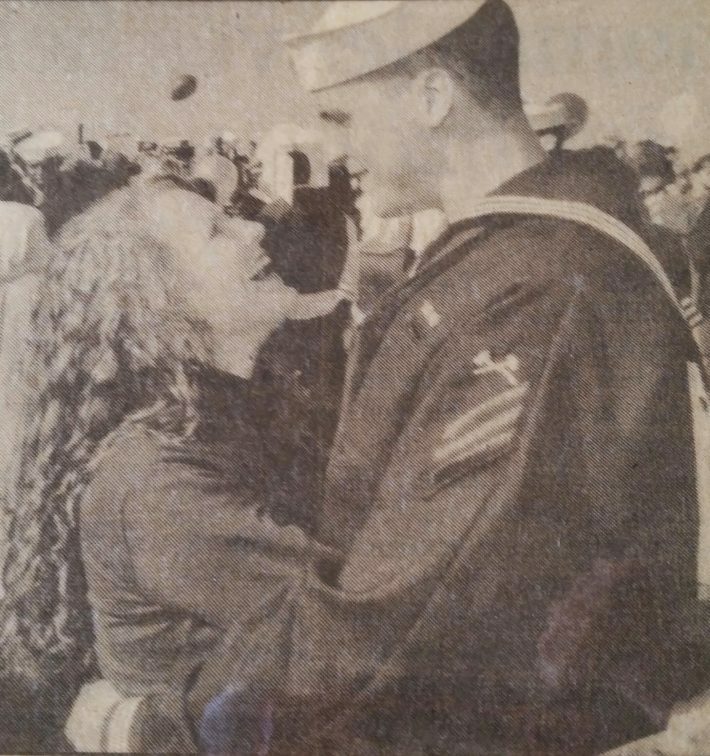 Of all the photos that were snapped that day ours made it into the newspaper and I believe it was even the front page of the section it appeared in. I’m honestly not sure we ever would have known if it hadn’t been for my friend Jenny’s thoughtfulness. I mean, I remember being asked our names by the photographer, but like I said there were a lot of people there and a lot of photos taken so we never thought ours would appear in the newspaper. And honestly, I don’t think it really mattered to us because we were just happy to be together again and had a lot of catching up to do. Now, though, nearly 25 years later, I’m really grateful for this photo and the wonderful memories attached to it.